You do NOT shut down Dame Vivienne Westwood. While admittedly not the most shocking headline in the world, the fact is this year’s Met Gala, celebrating the opening of the new “Punk: Chaos to Couture” exhibition at New York’s Metropolitan Museum of Art, did not only fail in the ordinary way we would expect this sort of high-profile, media-blitzed event to fail to live up to its punk theme, it managed to epically fail by contradicting itself in ways we actually didn’t even see coming. First and foremost, the hopeless live stream coverage thwarted what was basically the Met Gala’s only chance to garner any punk legitimacy when it shut down Dame Vivienne Westwood—quite plausibly the most important punk designer in the history of fashion, and one of the only original punks in attendance. After embarrassingly asking Dame Westwood which designer she was wearing (#lol/cringe), the vacuously sycophantic host Billy Norwich actually cut her off in the middle of her explaining why she had a large photo of Bradley Manning, the soldier at the center of the Wikileaks debacle, with the word “TRUTH” underneath, pinned to the front of her gown. Norwich single-handedly destroyed what would have been the Met Gala’s only actual punk moment. Unsurprisingly the rude treatment of punk fashion’s veritable fairy godmother sparked considerable outrage from viewers on twitter, but even more alarmingly, it wasn’t even the most tragic moment for the history of punk fashion that evening. Predictably there were a number of derivative accessories incorporating spikes, studs, and safety pins (or as in the case of Carey Mulligan, one single giant safety pin). There was also the odd bit of dyed hair, notably Nicole Richie’s silver quiff (which was actually pretty rad), Lily Collins’ blue streaks, and Diane Kruger’s token pink dip-dyed ponytail. There was some more daring heavy Siouxsie Sioux eye makeup (January Jones, Ginnifer Goodwin), as well as a fair amount of leather, plaid, and intentionally tattered fabric. But mostly it was total yawn-town. Want to press the snooze-button. The vast majority of guests couldn’t even conjure up a clichéd gesture at “punk fashion.” Sure Cameron Diaz’s clearly ad hoc spiked belt totally clashed with her deep purple Stella McCartney dress, but, hey, at least she was trying right? The overall lack of risk-taking—together with the striking abundance of pastels—seemed to indicate most Gala guests (at the most generous level of interpretation) chose to completely ignore the punk theme altogether. True it is a bit pathetic that despite having several months to prepare something that pays homage in some way to the history of punk fashion, these people still come up with nothing. But should we be rushing to say “shame on them”? Katy Perry missing the point. Completely. There is at least some argument that in this context to try and fail to be punk might actually be worse than to have never tried to be punk at all. 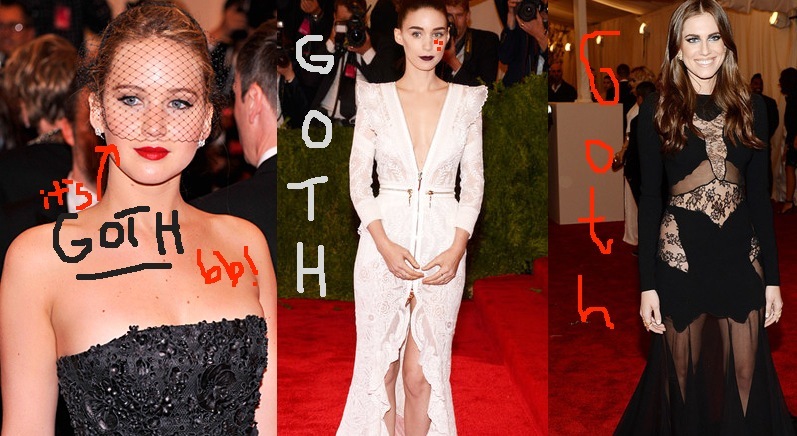 Here I’m referring to the greater portion of the Met Gala’s guests who were presumably making an effort to adopt a punk style, but ended up confusing it with “goth” style. The pervasive conflation of goth v. punk culture at the Met Gala is especially embarrassing during a punk fashion retrospective as it demonstrates a total lack of understanding as to how the two distinct styles have influenced the lineage of some of fashion’s most important designers, including McQueen, Lacroix, Westwood, and Rodarte. This not only effectively contributes to the stereotype that fashion is meaningless drivel that doesn’t deserve a place amongst more “serious” artforms, it also directly degrades the two subcultures involved by indiscriminately lumping them together. To outsiders it might at first glance seem like I’m splitting hairs here, as it’s true goth style sometimes incorporates elements of punk (re: an affinity for black, metallic jewelry, and fishnets), but as a former goth myself I can assure you the differences are far-reaching and crucial. Punks v. Goths: A Crucial Distinction. Goth style, for example, evolved from a fascination with the morbid, taking cues from the clothing worn by the mourning in the Elizabethan and Victorian eras, hence all the black, corsets, veils, and the interest in religious and occult symbols largely absent from punk. Jennifer Lawrence’s veil? Goth. Rooney Mara’s delicate white lace Givenchy gown by Ricardo Tisci? Goth. Rachel Roy’s massive black cross? Couldn’t be more goth. The Goth attitude is also totally distinct from that of punk. While punks are interested in actively subverting mainstream society, and might be seen aggressively protesting some political issue by angrily screaming some anarchist motto taken from a Crass song, Goths are melancholic, a subculture demarcated by its passive nihilism rather than its activism. Consequently goths are more likely to be found locked away in their rooms crying silently in existential solitude while listening to the Cure, or hanging out in a graveyard writing poetry about their perpetual longing to be dead. A good litmus test: Punks can beat up Goths, but never vice versa. This “Gothic tomb with Angel” might appeal to a goth, but would likely not appeal to a punk. In light of this distinction, we can see how the misguided gothic looks we saw coming from the likes of Anne Hathaway, Alexa Chung, Jessica Biel, Rosie Huntington-Whitely, and many others also constitute utter punk fashion fails. The punk aesthetic results from an entirely different spirit and attitude than that of the grieving goth from which these gowns are descendent. Regardless of how good they may have looked, by conflating these two distinct styles they have arguably done a worse job commemorating the history of punk fashion (and perhaps also the history of fashion, in general) than those who chose to ignore the punk theme completely. 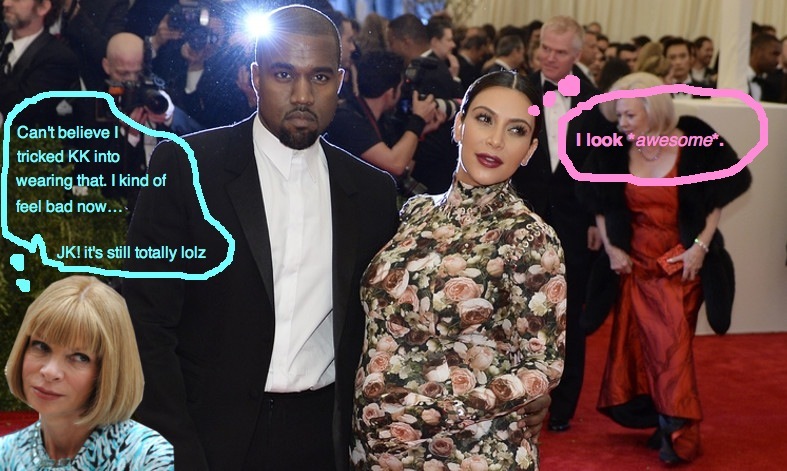 The Met Gala has undoubtedly been one of the most important annual events for moving fashion forward, and celebrating where it has already been, since its inception in 1948. Unfortunately, the various missteps of its guests this year—together with the disrespectful treatment of Dame Westwood and all that she represents for punk fashion—have caused more than mere stagnation, it’s the worst example of fashion contributing to the erosion of its own history.